I’ve received this watch from Konifer Watches but all opinions of the product are my own. Let a mom or someone meaningful to you feel special by gifting them a gorgeous quality watch for Mother’s Day. I’ve got a thing for watches! But not just any kind of watches. Along with telling the time, they have to look awesome be of good quality, and accessorize my outfits nicely. I’m kinda picky about them. But it’s been a while though since I’ve personally shopped for a watch for myself. My husband has gifted me some beautiful ones which I wore all the time. On one of my recent cosmetic jewelry shopping trips it occurred to me that I had no watch!! I thought I would buy one but decided to wait and probably shop around some. I didn’t want to just pick any kind.. I wanted to like it. 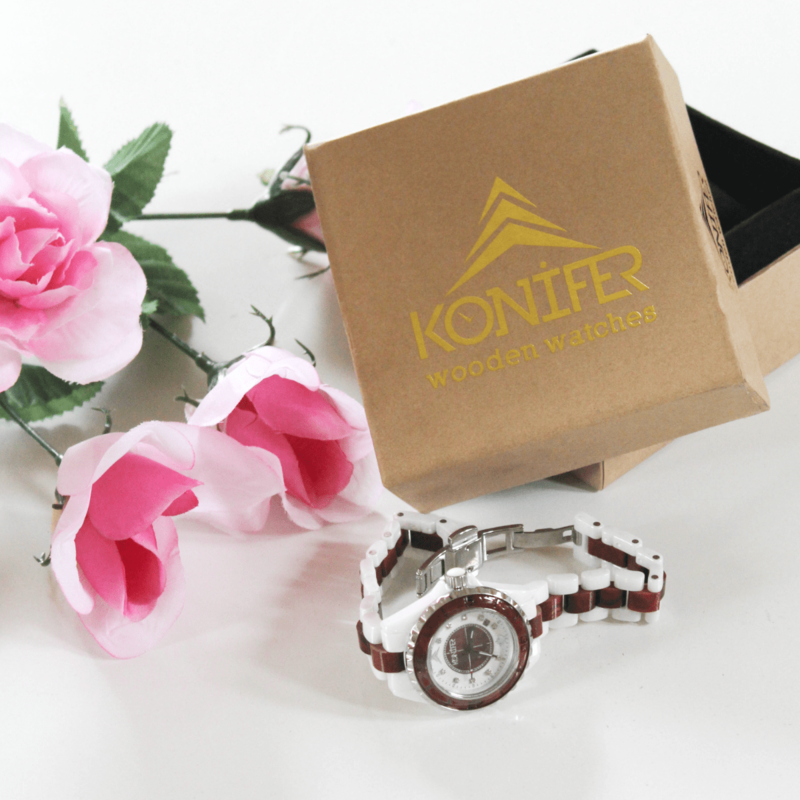 Then I discovered this online store called Konifer watch that carries quality watches both for men and women. They were willing to let me try one of their watches. Because I love watches, everyone of them looked good to me. But I narrowed it down to the Ceramik watch. The color caught my attention and I loved all the good qualities about the this watch. It’s made of wood with ceramic pearl and white details. Hence the name, Ceramik. It is totally natural and eco-friendly so it would not be harsh on the skin or on the environment. It’s also water proof and scratch resistant – there would not be any need to worry if you forget to remove it during chores such as washing dishes. I also love that the band can adjust to fit any wrist. Ever had a watch where the band kept stretching and stretching and eventually fell apart? Or the kind you were afraid to let a drop of water fall on because it might get ruined? You know, the cheap kind? Not so with this one. It does not look or feel flimsy. It’s a beautiful watch with beautiful qualities and the finish is made from smooth satin oil making it look very modern and classy. A watch like this would make a great gift for the mom who is all about good quality and all-natural yet beautiful timepieces or a gift for any lady who loves beautiful watches. Konifer watches has various styles to choose from. You can browse the styles for women here or see the entire selection of watches both for men and women by clicking here. What do you think of this watch? 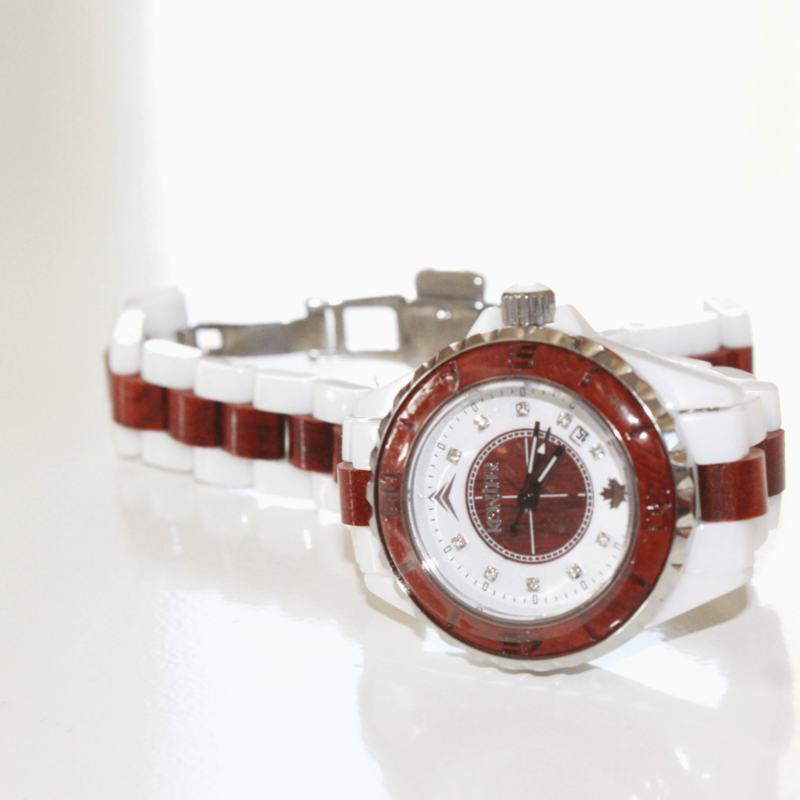 Do you love good quality watches or are you one who goes with any watch as long as it can tell the time? I would love to know your thoughts in the comments. What a beautiful watch!This would make a great mother’s day gift. I also have a thing for watches and have several in my jewelry box. My favorite is the one that belonged to my mom. Watches are always a favorite this one is beautiful!! I am glad you love watches too and I know your mom’s own is super special to you!! The contrast with the two tones is pretty and would definitely be a lovely gift. Thank you so much Lorelai!